How to handle common roadside fixes. It’s common for cars to fail in winter. If you get stuck roadside, all is not lost. Not all issues need to be handled by a professional. There are general fixes that the average Joe can do to get the car back up and running in no time. Read on for tips on how you can be ready for this winter (and all year round!). Winter driving can be tough, so don’t be caught unprepared. Before you get on the road, make sure you have all the tools you’ll need. Some of these items might come with your car and a typically stored in the trunk. Pull over to a safe place if you hear the tell-tale thunking sound. Lift the car with the jack – Consult your manual to see where to position your car jack. Do not put your body underneath a car lifted by a car jack in case the vehicle slips off. Put on the spare tire. Lower the vehicle and use the wrench to give the lug nuts a final turn. No matter where it happens, a dead battery is hugely inconvenient. Read your owner’s manual to locate the battery and make sure that your car can be jump-started. Find a willing helper with a fully functioning vehicle. Park it two feet away from yours. Pop both hoods, locating the batteries and the + and – signs. Attach the cables. Attach the good battery first then yours. Start the good car, rev the engine a touch and then let it idle. Disconnect the cables in the reverse order they were connected. Drive around for 15 to 30 minutes to allow the battery to fully charge. 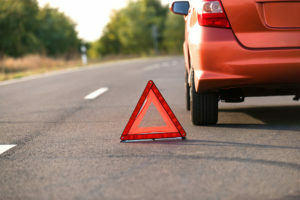 Contact the professionals at Abbate Insurance to secure the right auto insurance for your vehicle in New Haven, Connecticut. Our trained experts can match you with the right policy to suit your journey, needs, and car, all at the right price.